Larger sizes of bent trimmers have extended bottom ring handle, which adds comfort, cutting leverage, and more room for gloves. All models cut easily through most materials, including rubber sheet, fiberglass duct wrap, and duct tape. 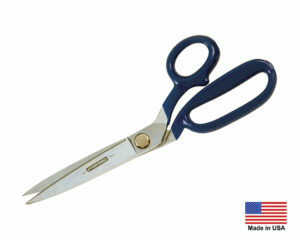 All forged shears made in USA. Our most popular models are shown here. We can supply additional sizes depending on your requirements. Call us toll-free and tell us about your application and we can help you find the model for you.